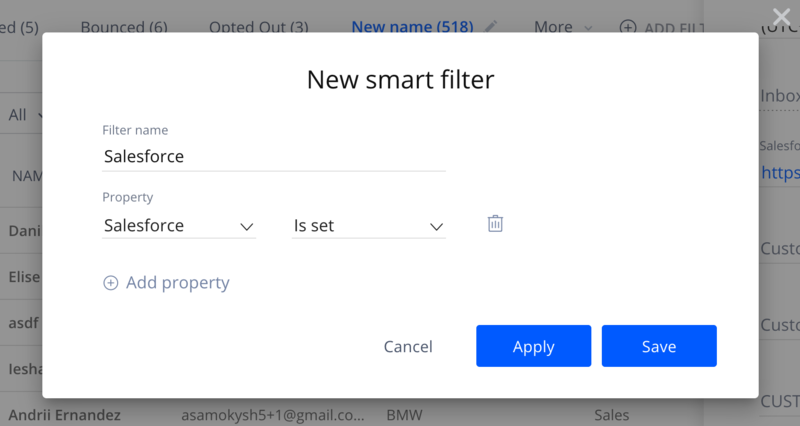 Learn how to make the most of our new Reply<>Salesforce integration: connect your accounts, sync data, map fields and automate workflows. The article describes how to set up 2-way integration between Salesforce and Reply. Log in to your Reply account and navigate to the Integrations page of the Reply interface. In the popup window, log in to your Salesforce account. The system automatically begins integration. Reply provides two integration profiles - Default profile and Custom profile. The Default integration profile has preset settings. You cannot change these settings, but you can begin integration immediately. You can always use this profile for quick and safe integration. Important: you CANNOT turn off, duplicate or delete synchronization steps, modify field mappings or filtering rules, change integration direction in the Default profile. You must use the Custom profile for custom integration. The Custom profile equals to the Default profile, but lets you create a custom integration between Salesforce and Reply. It includes several flexible integration options. To begin integration, switch to Custom Profile using the drop down list. To create a new synchronization step, click the Add Sync step button. You can add unlimited number of steps. You can set up synchronization in both ways: Salesforce - Reply, Reply - Salesforce. To change the direction of the synchronization step, click on the corresponding icon on the Add sync step popup window. Hover over the step and click on the Settings icon. Select fields using the SALESFORCE FIELDS and REPLY FIELDS drop down lists. You can set outbound filters when you edit a synchronization step FROM Reply TO Salesforce. For example, People in Reply - Leads in Salesforce. The outbound filters are based on the filters from the People page. This means that you can not only use standard filters, but also create custom filters on the People page and load them as outbound filters. You can also reset the loaded filter by clicking the Clear filter button. You can clone a synchronization step to copy its settings. To do this, hover over the step and click on the Clone icon. To remove a step, hover over the step and click on the Remove icon. On the Steps tab, hover over a synchronization step and click the Add action icon. In the Add action dialog box, select an action and click Add. Select a campaign you want to add your contacts to. You can remove the action by clicking on the Remove action icon. After you have assigned an action to a synchronization step, you see Exclude updated from action slider. The slider lets to push contacts to the same campaign after you update their fields in Salesforce. 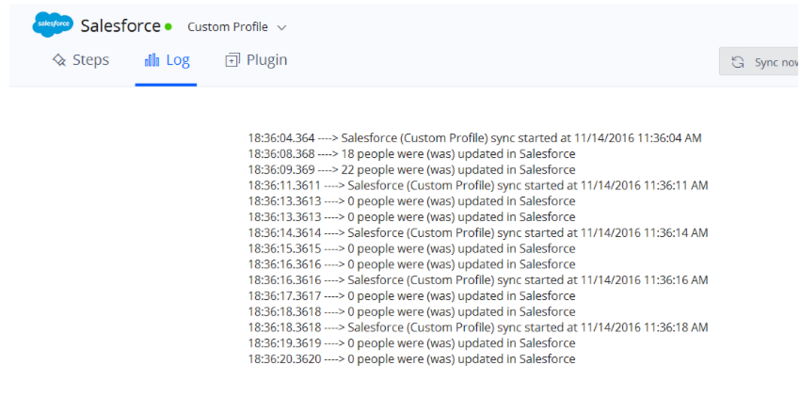 The Log tab lets you see the information about the latest synchronization activities between Salesforce and Reply. 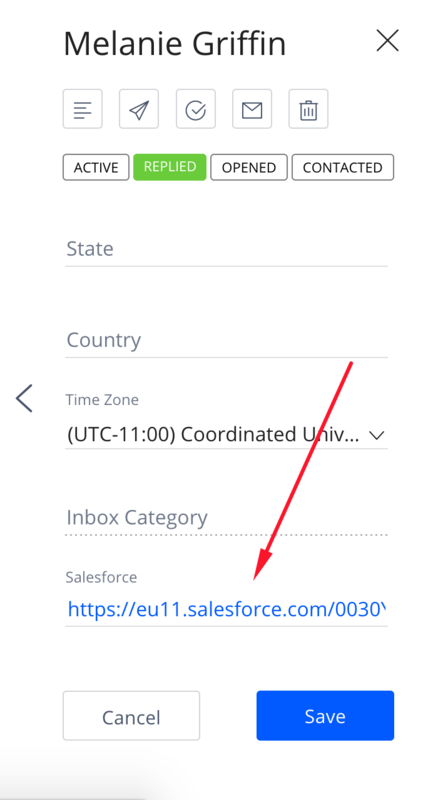 Note: In case the contact has been synchronized from Salesforce to Reply, the system creates a direct link to the contact in the contact sidebar. Click on the link to open it in the new tab.